My grandmother has been one of the strongest women in my life who has continued to inspire and amaze me over the years. Born on October 1, 1918, Midge Smith has survived every type of hardship that life can throw at you. Having made it through the Great Depression, she met he future husband, Norman Smith, who was working as a butcher at the time. The couple soon married before he was shipped overseas during WW2 and stationed in Kwajalein. After the war, my grandmother settled down with my grandfather and they had two children. My mom, Judy, born in 1948 and my uncle, Jeff, born in 1946. My grandfather turned his passion for cooking into a restaurant located in downtown Vallejo, California called, "Norm's Buffet." With my grandmother working alongside him, they turned the Haufbrau into a booming business, churning out hot sandwiches, mashed potatoes and gravy, and old-fashioned ice cream beverages. After many years of serving their community, my grandparents sold the restaurant and focused on the next phase of their life together. Papa Norman went in to real estate, while grandma worked for the next seventeen years at the Allergy clinic at Kaiser hospital. In the years to come, they saw their children grow up, graduate college, and start families of their own. After 55 long years together, Midge lost Norman on May 23, 1998: she was 79 and he was 88. The next eleven years that my grandmother would have to face without my grandfather would prove to be trying to say the least. In the early millennium, grandma met a woman named Joyce at her water aerobics class. They became fast friends, spending every minute together. A few years into their friendship, Joyce was diagnosed with cancer. After many surgeries and numerous rounds of treatment, the news came in early 2008 that her cancer had metastasized and was inoperable. In August of that same year, grandma had to have her beloved Shih Tzu, Tesse, of thirteen years put to sleep. On October 1, 2008, my grandmother celebrated her 90th birthday, and just a few short days later suffered a left-sided stroke that rendered her speech garbled, and unable to read, write, or tell time. One week into, what would become a very long recovery, Joyce lost her battle with cancer. My mom and I immediately began the search for the perfect dog for my grandmother. After weeks of searching for the right match at our local shelters, and coming up empty. There was this constant nagging feeling in the back of both of our minds that it was very unlikely that the animal shelter would relinquish one of their dogs to a 90-year-old woman who lives alone and had just had a stroke. Beth, a generous friend of the family, gave grandma a Chihuahua/Papillion mix named Tinkerbell. From that point on, she was on the road to a quick, but not so easy recovery. In the months that followed, grandma would undergo speech therapy, along with therapy at home that included puzzles, toy clocks, poetry, and coloring books. These were often times of great frustration and humiliation for her, but made all the easier with Tinkerbell lying beside her or perched on her lap. Grandma, during this time, would speak out loud around the house as part of her speech therapy. She would often tell us that Tinkerbell didn’t mind if she talked crazy. Whenever my grandmother was having a particularly difficult time with getting her words to come out right, she would take Tinkerbell outside and read “Cat In The Hat” to her while sitting on the front porch. Tink enjoys sitting on the bench and watching and barking at the neighborhood cats that dare to walk on her lawn. "Tink" has come to fill those long days and nights, slowly healing the pain of so much loss. Adding to this grief was the death of her older sister, Betty in January 2009. Tink has become a permanent fixture in grandma's life, always by her side wherever she goes, even becoming somewhat of a celebrity at various stores around town. “Tink, want to go for a walk?” prompts the raising of her bat-like ears and her scurrying to the front door. On the rare occasions when Tinkerbell doesn’t get to go, like when grandma goes to the doctor or goes out to a restaurant, she barks like mad from her perch at the kitchen window and doesn’t stop until grandma’s car is out of sight. When she arrives home and says, “Hello” to Tinkerbell, she turns her head defiantly. The cold shoulder act only lasts a few minutes before Tink’s right by grandma’s side again. Grandma puts Tinkerbell in a walker with a pouch on the front. With a little tiny head poking out, they make their way along the street where she lives. Stopping to talk to neighbors and anybody who seems drawn to the tiny dog with a big personality. When not out and about with grandma, Tink likes to spend her time in the backyard stalking the squirrels on the telephone wires, which seem to enjoy taunting her. On October 1, 2009, my grandmother celebrated he 91st birthday and complete recovery from he stroke. 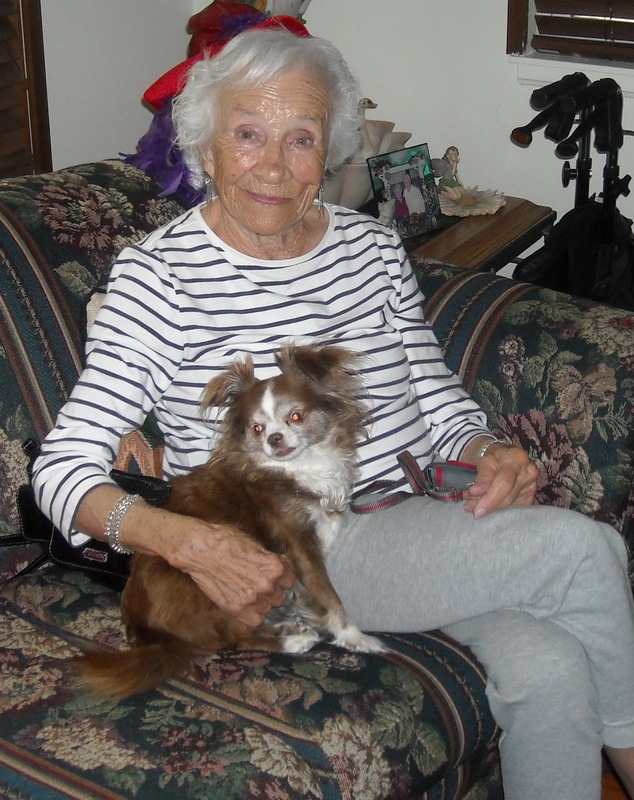 We know and so does my grandmother, that without Tinkerbell in her life, recovery would not have been possible.